Metallic Gold and Black Striped Cupcake Wrappers for Elegant Weddings & Celebrations, Graduations, Anniversary, Birthday & Gatsby Parties, Bridal Showers. Set of 24 Reversible, Adjustable Cup Cake Hol by Saybrook Products at My Beautiful Cake. Hurry! Limited time offer. Offer valid only while supplies last. AN EASY WAY TO MAKE ANY CUPCAKE LOOK SPECIAL! 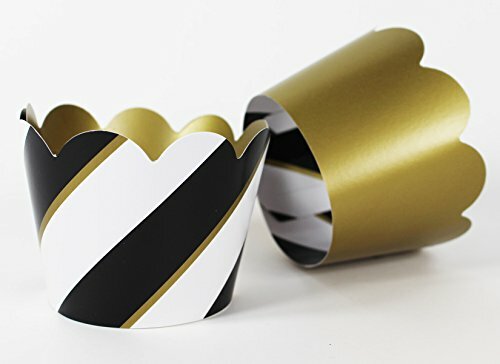 - set of 24 reversible, bottomless cupcake wrappers with solid metallic gold on one side, reversible to black and white stripes on the other. Makes a beautiful presentation for your cupcakes that you'll be proud to display on your dessert table! EASY TO ASSEMBLE, just insert the tab into the proper slot, place your cupcake inside, arrange your cupcakes on a holder or tower - your party guests will love the look! SO MANY WAYS TO USE: as a cupcake wrap, drink sleeve or wrapped around a cup filled with mints, nuts, candy or sweets, party buffet treats and more. Mixes beautifully with all your themed party supplies and decorations. PERFECT FOR LOTS OF OCCASIONS: weddings, bridal showers, baby showers, 40th, 50th, 60th and beyond birthday parties, anniversary or retirement celebrations, charity galas & benefits, graduation parties, New Years Eve, Thanksgiving, Christmas holidays or any occasion where you want your dessert table to look special! PROUDLY MADE IN THE USA of sturdy, good quality cardboard. And because we stand behind the quality of our product, if you're not 100% SATISFIED with your cupcake wrappers, we're happy to refund your full purchase price. If you have any questions about this product by Saybrook Products, contact us by completing and submitting the form below. If you are looking for a specif part number, please include it with your message.